Mr. James N. Suciu is President of Global Sales and Marketing for General Electric Energy Infrastructure and is a Vice President and an Officer of the General Electric Company. 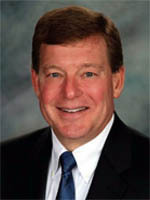 He graduated from Purdue with a bachelor’s degree in mechanical engineering in 1982. Mr. Suciu began his career as a member of General Electric’s Technical Marketing Program (TMP) in 1982 with sales-focused assignments in medium and large steam turbine businesses in Lynn, Massachusetts and Schenectady, New York. After graduating from the TMP, he held sales positions of increasing responsibility for GE’s Power Systems business in Fitchburg and Schenectady, focused on industrial, chemical, and petroleum markets. In 1992, Mr. Suciu relocated to Singapore, where he held leadership roles responsible for sales, business development, planning, and marketing for the Asian region. Three years later, he was appointed Commercial Leader for China and North Asia, based in Hong Kong. Mr. Suciu returned to the United States in 1997 as General Manager of Commercial Operations for GE’s Global Energy Products business. In October 1999, he was appointed to the position of Vice President of Energy Services Sales for GE Energy, and he was also named a GE Corporate Officer. Under Mr. Suciu’s leadership there are more than 4,000 commercial professionals in both sales and marketing, driving key strategic growth initiatives across the Power & Water organization. He has led the team to solve regional and global challenges, introducing successful products, services, and solutions that have positively impacted the overall health and welfare of the world’s populations. Mr. Suciu serves on GE’s Corporate Council and is a board member for the Georgia Chapter of Junior Achievement. As a Purdue undergraduate student, he was a member of Alpha Tau Omega.